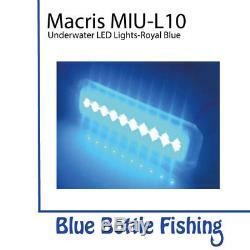 NEW MIU-L10 Underwater LED lights- ROYAL BLUE from Blue Bottle Marine. 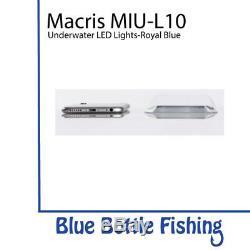 MIU-L10 Underwater Ultra Thin LED lights- ROYAL BLUE. A powerful lighting option for small boats up to 8m, the new MIU-L10 underwater LED light is small in size without compromising on performance. Developed for the small boat market, the MIU-L10 is only approximately 200mm long, and featuring Macris' ultra thin impact resistant profile. If an item is ordered, but out of stock or will be delayed, we will inform you. Please read policy below before emailing us. If such items are found to be defective upon arrival, such items may be exchanged for an equivalent new item only. The credit issued for any item received in such condition will be discounted or the return will be rejected at our discretion. We require the return of the damaged or defective part. Part numbers of the defective or damaged parts, as well as digital photos showing the condition of the part, are extremely helpful in expediting such replacements. (6) I received an item I did not order. How do I return this item? To facilitate return of the item. (7) I dont understand the installation instructions. Can I return the item? As with any aftermarket part, proper installation requires a certain degree of mechanical skill, ability, and the proper tools. We always recommend having a qualified, competent mechanic install parts that are beyond customer abilities. When ordering, please keep in mind that many of our products are designed for worldwide distribution and not necessarily for primarily English-speaking markets. As such, many of our products include only an exploded parts installation diagram with sparse notes which may or may not be in English. We try to be as detailed as possible in the product description, and in many cases we attach digital copies of the mounting diagrams to the product descriptions on our website. In addition, we often post photos and installation notes on our website that are provided by other customers. We do not warrant the accuracy of this information and take no responsibility for damage or injury caused by improper installation of products presented on this website. (9) How do I arrange for a return of an item to Blue Bottle Fishing? Please do not attempt to force a return by sending us a part that is not authorised for return as specified above or by specific confirmation from us. Chargebacks for goods delivered as ordered is theft. Customers placing orders with Blue Bottle Fishing, consent to the terms of the policies outlined above. Based in the Hills District of Sydney, we provide anglers with fishing reel handles, tackle and marine products. Our marine products include a large range of quality products, all a must for any angler and their boat. 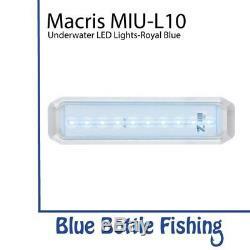 The item "NEW MIU-L10 Underwater LED lights- ROYAL BLUE from Blue Bottle Marine" is in sale since Tuesday, October 03, 2017. This item is in the category "Vehicle Parts & Accessories\Boat Parts, Accessories\Electrical, Lighting". The seller is "blue_bottle_marine" and is located in Dural.